The Village is on fire right now with celebrities coming and going. Heidi Klum is renting in the ‘hood for the summer; Topher Grace is renting out his loft; Francis Ford Coppola is moving into the same building as De Niro; and just this morning we learned that Julia Roberts is selling her apartment. Now, Hilary Swank is the latest star on the list. The Observer reports that she’s renting out her stylish apartment at 400 West 12th Street (the Superior Ink building) for $20,000 a month. 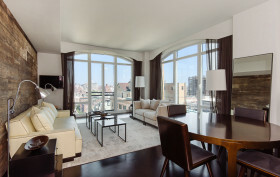 Swank bought the 1,500-square-foot, two-bedroom condo in 2009 for $3.64 million. She then enlisted designer Mark Zeff to “create a place that would give her a sense of grace and harmony.” The space was photographed for Elle Decor in 2011, where the neutral palette, clean-lines, and serene decor were featured prominently, as was the living room wall made out of reclaimed barn wood. But now that the actress is spending more time on the West coast, she’s looking to rent out her West Village home.